The Pale or Pallid Harrier (Circus macrourus) is a migratory bird of prey of the harrier family. This medium-sized (40-48cm), narrow winged, lightly built raptor breeds on open plains, swamps and heathland while semi-desert, scrub, savannah and wetlands are used in winter. So in winter it is a bird of open country. Here in Gujarat we generally saw them during winter in-between August and November and they return in March and April. We frequently saw this bird in Velavadar National Park but they are mostly female and juveniles. 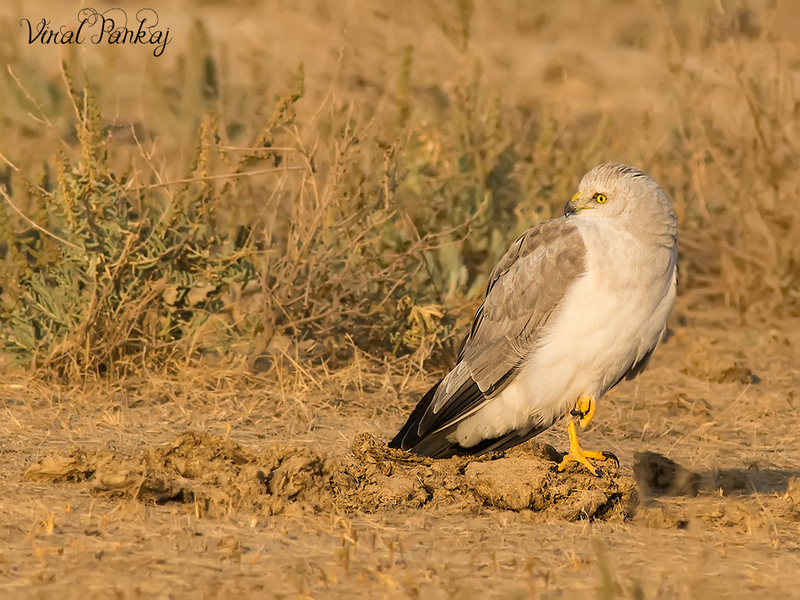 One fine morning we started our search of Peregrine Falcone in Little Rann of Kutch. After done formality at forest office we enter into the Rann. On the way to probable Falcone-area we found single male of Pallid Harrier instead of Peregrine Falcone. This adult male is unmistakeable, with pale grey and white plumage, relieved only by black wing-tips. It was really so pale or almost looks cottony white in golden sunlight. It was perched on open ground with small vegetation. We just can’t wait to approach the bird and took some amazing click of this Pallid Harrier. Guajarati name of Pallid Harrier is ઉજળી પટ્ટાઇ (Ujali Pattai) and it really looks Ujali mean pale.